Patent leather shoes are super chic and edgy, but they're not always known for being comfortable. Genuine patent leather consists of a thin, supple leather that is lacquered to a glossy shine with a plastic or synthetic coating. 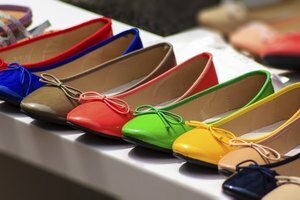 While the lacquering process lends patent leather shoes their signature sheen and significantly increases their durability, the shoes become inherently stiff. Of course patent leather heels or flats will never be quite as comfy as your running shoes, but here's how to soften them up before you wear them out and about. Rather than buying a brand new pair of Mary Janes or patent leather heels the day before a big event, shop in advance. Before wearing them out on the town, wear them at home for a few hours over a couple of days. General wear helps increase flexibility. If you need to accelerate the break-in process or you're dealing with particularly stubborn patent leather footwear, stick some moleskin pads to the parts of your feet where the leather is most inflexible, such as the heel. You can also double or triple up on thick socks to make the shoes more pliable and stretch the material a bit. To really give the shoes a good stretch, warm them up with a blow-dryer on low heat, then stuff them with tightly-packed newspaper and leave them overnight. Never, ever soak leather shoes in water. 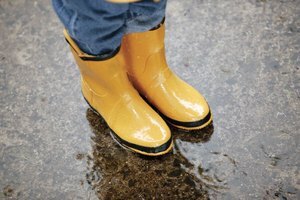 While patent leather holds up well in the rain, getting soaked can shrink and damage them. 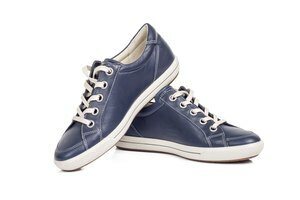 Keep the shoes in a warm, dry area between wears to let them thoroughly dry out, otherwise they can crack and become brittle. Don't put patent leather in the dryer, as the tumbling motion may cause irreparable scuffs.